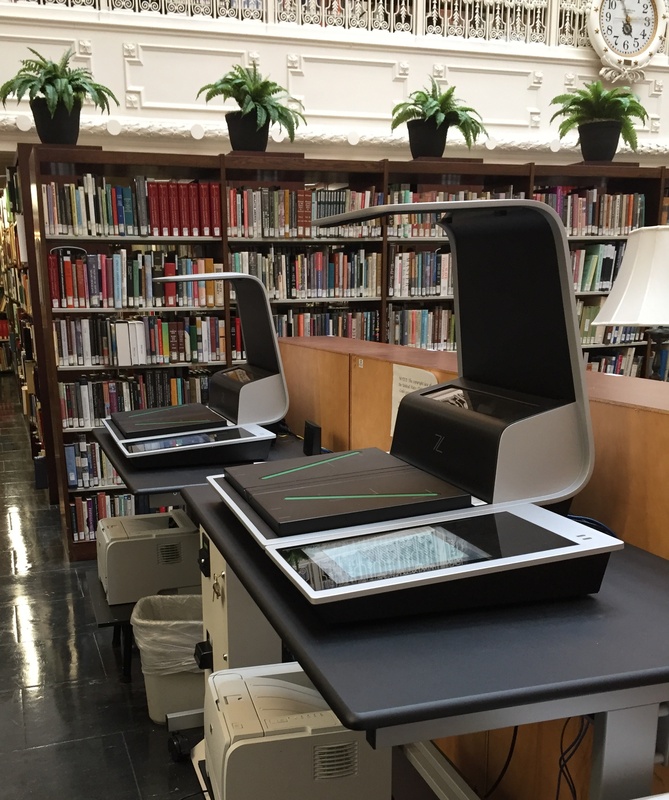 The next time you visit the DAR Library, you might notice that we’ve been making some enhancements to improve the accessibility of some of our resources. 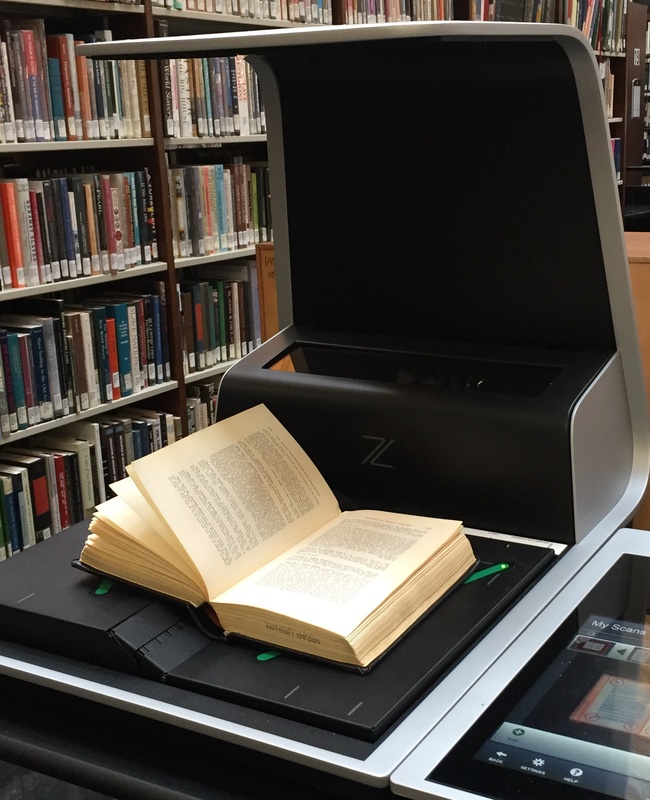 Thanks to very generous donations from the Georgia State Society, Sharon De Puy of New York and Joan Peters of Washington, the Library now has book scanners that are available for patron use! These book scanners offer some great advantages over photocopy machines. We anticipate that these scanners will better meet the needs of researchers and will help to protect the condition of the books and materials in our Library. One aspect of these scanners that makes them easier for researchers and less harmful for the books and materials is that they are overhead scanners. This means that you don’t have to turn the book upside down and press it flat to make a quality copy. You can see the pages that you are scanning so you don’t have to “guess” about whether the page you want is lined up correctly on the plate of the photocopier. You also don’t have to press on the spine of the book to get it to lay flat on the copier (which often resulted in broken spines and loose pages). The scanning area is also a little bit larger than the standard photocopiers so It’s easier to work with books or materials that are a little bit larger than the average size. 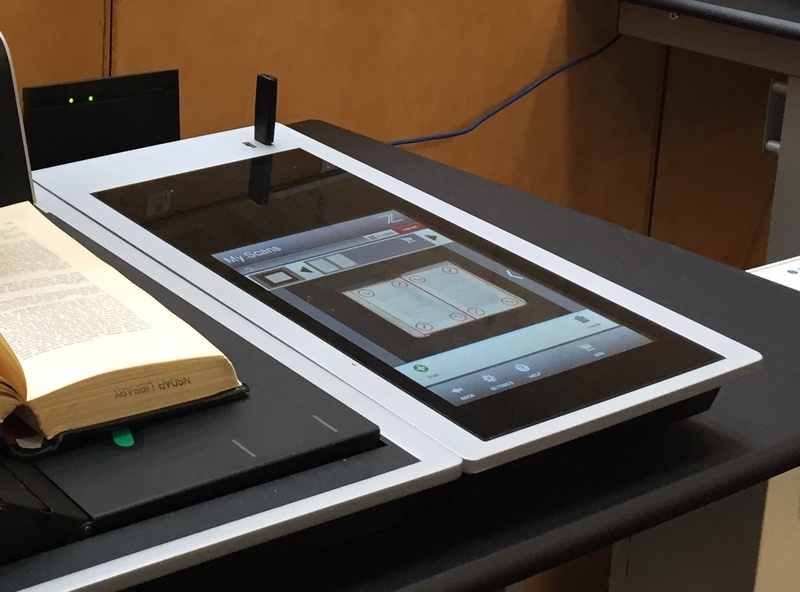 To use one of these scanners, simply place the book on the book “cradle.” If it’s a large book, you can adjust the angle of the cradle to compensate for the curvature of the pages near the spine of the book without putting extra pressure on the spine. Use the touch screen display or the buttons on the book cradle to scan the page. The scanner can automatically compensate for some variances in the page by compensating for slight curvature of the pages near the spine of the book. Images can also be scanned in color which can make it easier to read the resulting scans of books with older typeset or slightly faded text. Once the page has been scanned, you can use the touch screen to look at the image to make sure it’s clear and legible; do some minor cropping or adjustments; and either add the image to your “shopping cart” or delete the image if you don’t want to save it. Once you have finished scanning the images that you need, whether it’s one page or multiple pages, you can review the images in your shopping cart and pay for the images that you want to keep. You have several options for retrieving your images: you can save them to a USB flash drive as a PDF document or as JPG images; you can email the images to yourself (this works better with one or two images rather than with large batches of images); you can send the images via Wi-Fi to your iOS or Android device (this does require installing a free app on your device); or you can print paper copies of the images (black and white only). Regardless of whether you save your scans as digital images or print them out in paper form, the cost is 25 cents per image. Don’t worry if you’re not comfortable with this new technology, yet. We have staff members who can help you. We also still have two regular photocopy machines, and we allow researchers the ability to use personal cameras to make digital photos of textual Library materials for a daily fee. Plan your visit to the DAR Library today!